First off, I am in love with the book's placement. It was placed in France, in the 1770. LOVE IT! I could not put this book down! This is a romance, and a good one at that. You will fall in love with the main character and Lucien! The book was extremely well written, and there was never a moment too dull. There was always something happening. Stephanie had a way of throwing things at you, and you never see them coming. I had my fair share of shocks when different things happened! I thought that was brilliant. At the end of the book, I was a bit worried that things weren't going to go my way, but it happens within the last 10 pages, which I was happy about. There is no doubt when I give this book 5 out of 5 book-a-saur paws! Me: First question: What inspired you to write Affaire de Coeur? Stephanie: Well, at first it was just a slight interest in the 18th century & my best friend. That only inspired the first ten pages, haha. Then I watched Marie Antoinette directed by Sofia Coppola and became more attracted to the era, which led to more research. And voila, Affaire de Coeur began to write itself. Stephanie: Actually, I didn't. I went to film school hoping I would go into directing, but I wasn't very good at it. Writing was an accident, which turned into a passion. Me: How long did it take you to write Affaire de Coeur? Stephanie: Three months, from December 2010 to February 2011. Stephanie: Originally it was "Such is Life" because my best friend used to say it so much, she was the basis for Colette. I went back and forth between the English and French of it, then I scrapped it because it didn't feel right. Then it was title Cri de Coeur, which also didn't feel quite right. I was reading some French poetry and saw, "affaire de coeur". It sounded right. Me: Is there going to be a second book? Stephanie: Yes, actually! A lot of people who read the book want to know what happens with Madeleine & Lucien. I have about ten pages already written for it. Me: YAY!!! *Ahem* Are you working on any other books? Stephanie: I am, right now I have another 18th century romance. It's titled Let Them Eat Cake. It's more light hearted, a comedy. I'm having fun writing it! Me: Is there any advice you would like to give to writers out there? Stephanie: Keep writing. The more you write, the more you learn. Telling a story isn't easy, but if you keep at it, it'll love you back & you'll have something amazing to share with the world. Me: Thank you Stephanie for your time! I really appreciate it! The interview was a blast! Read on to learn more about the book. Paris, May 1770—in the midst of aristocracy—country girl, Madeleine Dumont is privileged to partake in social events while living with her friend Colette du Lorme, daughter of a Marquis. While following in the shadow of her popular and socially versed friend, she is caught up with her infatuation with a man—a Comte. Lucien de Laurent is one of King Louis XV’s favorites and established bachelor social recluse. How does a woman win such a man without playing the game? Stephanie O'Hanlon graduated from the Toronto Film School with aspirations of starting a career in film, but found herself drawn to writing. After self-publishing her first novel, a vampire historical romance, she decided to narrow her sights on general historical romance, fuelled by her love for history, the 18th century in particular. Now a full time writer, she lives in the city of Oshawa in Ontario, Canada. More information can be found on her Facebook page or her Blog. 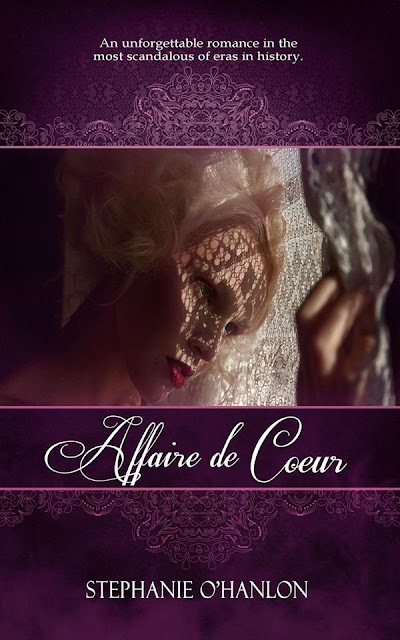 Affaire de Coeur is available through Eternal Press, Amazon, Barnes & Noble, Kobo, & Chapters Indigo, as well as many other fine online retailers.